different question types with detailed score reports. 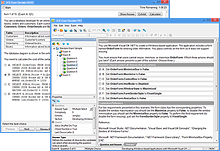 An exam engine for certification exam preparation. Take exams that are just like the real thing. Need to pass an exam? Prepare yourself for success on exam day by taking practice exams with Visual CertExam Suite. Spend a lot of time on the go? With VCE Mobile, you will be able to prepare for your exams from the road. Need a customized training solution for your institiution? Install the VCE Simulator on an unlimited number of computers through company licensing.